Munnar is one of the most popular hill station in Kerala, which is located in Idukki district of Kerala.Munnar is situated at the confluence of three mountain streams – Mudrapuzha, Nallathani and Kundala. This beautiful hill station is spread by unending expanses of tea plantations, colonial bungalows, rivulets, winding lanes, waterfalls and cool weather. The highest peak in South India – Anamudi is located on Munnar. The main cultivation crops in Munnar are tea and coffee. Among the exotic species of flora and fauna found in its wild sanctuaries and forests. The beautiful attracted grasslands in Munar is the Neelakurinji. The neelakurinji flowers blooms once in every 12 years, looking Munnar into carpets of blue and purple. 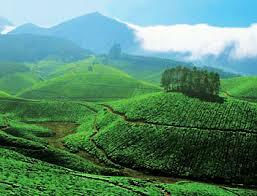 Devikulam: Devikulam hill station is located about 16 km from Munnar at an altitude of 1700 meters above sea level. The green hill station is famous for its crystal-clear lake of Sita Devi. Eravikulam National Park: This National Park is located about 15 km from Munnar, this park is famous for its endangered inhabitant – the Nilgiri Tahr. This park is also home to several species of rare butterflies, animals and birds. Anamudi Peak: The highest peak in South India is located inside the Eravikulam National Park.This is standing at a height of over 2700 m.
Pallivasal: The venue of first Hydro-electric project in Kerala, Pallivasal is located at about 3 km from Chithirapuram in Munnar. This place is favoured by visitors as a picnic spot and scenic beauty. Attukal: Attukal is located between Munnar and Pallivasal. This place is famous for its panoramic views of the green verdant hills and waterfalls. Mattupetty: Mattupetty is located about 13 km from Munnar Town. Which is situated at a height of 1700 m above sea level. Mattupetty is famous for its storage masonry dam, beautiful lake and dairy farms. A large variety of high yielding cattle are reared in Mattupetty. Chinnakanal: Near the town of Munnar is Chinnakanal and the Power House Waterfalls is here. Anayirangal: Anayirangal is located about 7 km from Chinnakanal and 22 km from Munnar. This place is a lush green carpet of tea plants. Top Station: Top station is located about 32 km from Munnar is at a height of 1700 m above sea level. This place is the highest point on the Munnar-Kodaikanal road. Top Station is favoured by visitors to enjoy the panoramic view. Chinnar Wild Life Sanctuary: This sanctuary is about 60 km from Munnar towards Udumalpet and close to Marayoor. Nearest Railway Station: Aluva ( 110 km ). Nearest Airport: Cochin International Airport ( 125 km ).